Our lives are made up of the path we forge from the opportunities presented to us in our own set of circumstances. 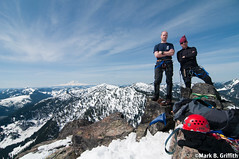 Had we never moved to Washington, I doubt whether I'd ever taken up mountaineering or with this weekend dabbled with alpine climbing (be it ever so small). A short 40 minute drive from my house is Snoqualmie Pass and the Alpine Lakes Wilderness of the Mount Baker Snoqualmie Forest. Beautiful trails and lakes are surrounding by majestic granite peaks of the cascade mountain range, the great secret of Seattle. Was there not this opportunistic field of possibilities, my development in the outdoors would have been much slower and required greater effort. Tucked away up a small narrow valley is Alpental, a ski resort in the winter and a magnificent trail head in the spring, summer and fall. 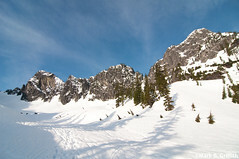 Guye Peak, Snoqualmie Mountain and Snow Lake are all within a few short miles of the parking lot. At the upper end of this valley below the ridge line sits Source Lake, the beginning of mighty South Fork of the Snoqualmie River which carved the canyon that I-90 follows. Above Source Lake is Chair Peak and a beautiful ridge line of peaks that circles back down to Denny Mountain above Alpental itself. In the middle of these is The Tooth which sits above Pineapple Basin. 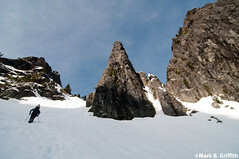 The Tooth is probably many folks in Washington's first alpine climb as it was mine. Proximity to Seattle with an easy approach and a short climb (4 pitches) with great views of the surrounding area make it extremely popular. Seth and I started out early. We met at the Safeway in North Bend at 5 am and were at the upper parking lot in Alpental and on the trail by 5:45 am. We followed the trodden trail up the middle of the valley staying to the left of the creek. The week prior J.K. had climbed the Tooth with the WAC and we were thankful for the foot path. The snow was firm in good condition and we made good time to the end of the valley and the "big hill" where we turned south-westerly and waded up through the deep snow. Purchase was hard to come by as each step sunk and fell out from underneath me in the snow. Finally frustrated I stepped in the glissade paths of the previous days and made good progress to the top. 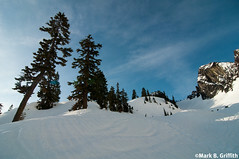 At the top of the ridge line is Pineapple Basin which is framed by Chair, Bryant and Hemlock Peaks. At the far end of the Basin is the Tooth and the pointy fang of a gendarme that guards Pineapple Pass. 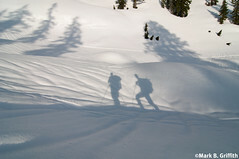 We made good time up the basin, watching our shadows grow as the sun crept over the ridge behind us and to our left. Midway up the basin a cornice broke off atop Bryant and slid down over the rock and came crashing down into the basin below us. Watching in awe I caught it on video, as I just happened to have my camera out. Even had we been lower in the basin the slide petered out well before the climbers path. 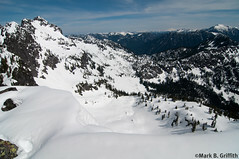 After the snow settled Seth and I both turned back around and looked at the ridgelines above us scouring for cornices. None to be seen we carried onward and upward. As we approached the final steep slope before Pineapple Pass we looked behind us to see small figures of climbers moving just into the Basin behind us. 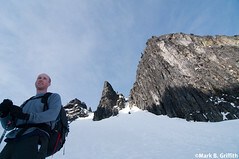 The early bird gets the Tooth I thought and we hurried up the steep snow over Pineapple Pass where we traversed north around behind the base of the gendarme to the base of the southwest face of The Tooth. We stashed our snowshoes and Seth's pack and got out my brand new rope ("pretty" was how another team described the bright orange color) and we put on our harnesses and tied in. I carried my pack, stuffing my camera in side with Seth's bag of food. As we were getting ready the first of the party we'd seen down below arrived. They were with the WAC and had a group of 8 students they were taking up. On belay I fed out the rope while Seth led. As he reached the belay position and after taking up rope, yelled down "On Belay" and I yelled up "climbing" and up I went until I reached his position. Where again I belayed and he led. I am sure my form wasn't pretty, that I used my knees in a place or two but I got myself up without Seth having to pull. I had a bit of difficulty removing the anchors Seth had placed in a couple of spots. The second pitch had a particularly stretching move just below the belay where I had to wedge my left foot on a small ledge and reach my right arm up into a large crack to pull myself up. The last pitch with its airy catwalk ledge took some nerve to step across the break in the ledge, but firm cracks for handholds above and the rope assuaged the fear and beating heart. In a short 60 minutes were were on top the Tooth. Alone on the summit with amazing blue sky, high clouds and stellar views for 360 degrees from Denny Mountain, to Mt Adams, Rainier, Granite Mountain, Glacier Peak, Stuart, Lundin, Red, Thompson, Snoqualmie, Guye and on and on. We unroped and sat on the bare rocks and took in the scenery while eating some food and drink. We spent another 20 minutes taking photos, including the requisite summit shot. Before anyone else arrived we roped back up and prepared to rappel down. First Seth and then I would follow. This was an interesting process of navigating among those who were coming up. In a few places at belay stations Seth or I waited on climbers ascending so we could freely rappel down. Along the way I met Carlos a friend of Ingunn and JK's. I also met Nadia Hakki a friend of Geroge and Cherry's from their days in the WAC. A small world even up in the mountains. After reaching the bottom we gathered, stored and loaded all the gear and made our way back to the top of Pineapple Pass. A few short glissades later we were in the flat section of the Pineapple Basin and in the middle of a group of Mountaineers who'd been practicing self arrest on the hillside above. Everyone was swimming in snow with postholes often up to your mid thigh. Seth and I threw on the snowshoes and we stayed on top of the snow and made excellent time, passing all the Mountaineers and beating them back to the top of the ridge above Source Lake. We glissaded down to the valley floor and then stumbled, slipped, fell and postholed our way back to the car. We arrived at 1:45 pm 8 hours after our start. Seth jumped on a con-call and we headed down the pass to the North Bend car swap rendezvous. Some thoughts about the experience looking back. I'm amazed that such an experience is to be had in such a short distance from my home. I'm grateful to Seth for taking me up, for bringing the rack and leading the climb. He's either introduced me to or been with me along most every step of my mountaineering and alpine experience. Its a pleasure being in the mountains with such competent and friendly hands. As I sat in a belay position below and watched Seth lead the climb, over the past day or so I've had had some thoughts about the process. While by no means is the climbing on The Tooth extremely difficult or long I was still struck by the lessons to be had in climbing. In the context of this story of The Tooth I share them, with apologies for my naivete in terminology and description. When rock climbing, the goal is to make your way up a rock face while ensuring you and your partners safety. One leads the climb while the other belays, both wear harness which encircles the legs and the waist. The person in the position of belay has three points of contact. First his/her harness is anchored to a immovable station, Second his/her harness is tied into one end of the rope, and third a belay device is attached to the harness via a locking carabiner. The lead climber also has three points of contacts. First his harness is also tied into the opposite end of the rope. Secondly his rope adjacent to his end is fed through the belay device attached to the partners harness. As the lead climber begins climbing, the belaying partner plays out the rope, but holding it in a locking position. The lead climber's last point of contact is as he climbs he periodically places anchors (protection) into the rock and clips his rope through them. Thus should the lead climber fall, he will not free fall because of his partners belay on the rope and he will only fall as far as he has climbed above the point of his last anchor. Having said this its important to understand the distinction between the climber that leads and the climber that follows. He who leads truly leads. He begins ascent without protection at all. Confidence and care are required because until that first anchor is placed, a fall is a fall all the way to where he began and there is no safety from the one on belay below. Immediately after placing the anchor (usually just above or level with him) the lead climber stands safe as he is immediately adjacent the anchor and his rope is clipped in. Should he fall at this point he will fall no distance, as the rope is taught between his harness and the anchor point above him. However from this position again the climber must lead out above the anchor point. The further he climbs before placing an anchor the farther he will fall. And while the rope and belay offer protection, the fall will still hurt and each lead out requires an act of will of pushing up and beyond the safety point in search of the next anchor. I never led on this climb. I only followed. Following is done after the lead climber reaches a belay point, which must be found prior to the length of the rope being reached. From here the lead climber anchors himself via the harness, and pulls up the rope till slack is consumed, then feeds the rope through his own belay device and clips into the carabiner. The climber below begins climbing up and as he does the rope slack is taken up. The climbing follower is never in any real danger of a fall, should he slip the rope is always there to catch him. As he makes his way up the route he removes the anchors placed by the lead clipping them to his harness as he goes. While both climb, one leads and the other follows. And like many of the paths in life, either metaphorical or real, the roles should not be misunderstood, taken for granted or confused. One leads; the other follows. Nice - glad you guys had a good trip and safe journey! Those are very nice photos and it seems that you had a great fun with that adventure.